They’re tired, emotional and getting sick of carrying around a huge full-term bump. Sound familiar? 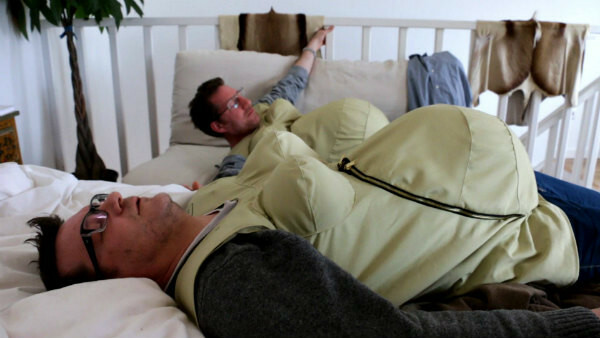 But these aren’t mums-to-be – they’re three dads who have decided to try pregnancy on for size. Jason Bramley, Steve Hanson and Jonny Biggins, Britons working together in Barcelona, decided to wear pregnancy suits for a month after a business meeting turned into a dare. The trio say the idea was born from a conversation about how they could honour their own mums for British Mother’s Day on March 15, as well as Anna Jarvis, the woman who trademarked the term “Mother’s Day”. 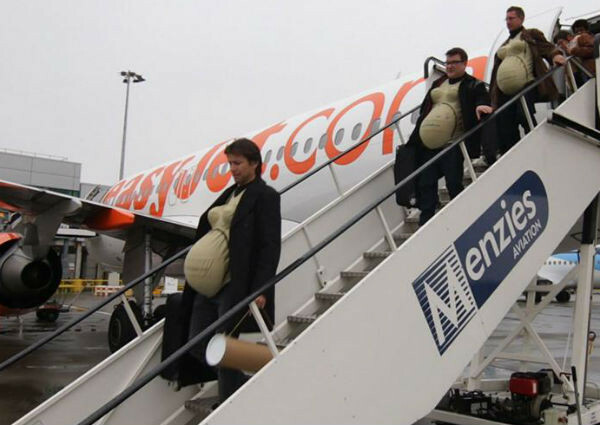 So they donned the “empathy suits” – complete with breasts and 15kg bellies – and set about their daily business. They wear the suit all night and day, except for when bathing, and are recording their experiences and the reactions they’re getting on their blog, Three Pregnant Dads. As well as day-to-day activities, so far they’ve been to parties, the cinema, on a plane for a business trip to London and been interviewed on a British TV show. “We’re trying to empathise a little and go through some of the physical discomforts women go through, though not all of them,” Biggins tells Yahoo! Parenting. Halfway through the challenge, it’s fair to say they have a whole new appreciation for what pregnant women go through. Even by the end of day one, dad-of-one Jason, 44, was already complaining of an aching back and sore shoulders. By day three, he was documenting his “very troubled sleep”. “I woke up constantly overheating and wrestling with my new assets,” he writes in the light-hearted blog. Steve, 46, also a dad of one, says his fake pregnancy has brought a host of “firsts”. “Honestly, huge respect goes to all you pregnant mums out there. Every single one of you – one tough mother,” he writes. The dads, who work for The Book of Everyone, will be wearing the suits until British Mother’s Day, on March 15.